Kimwipes EX-L wipes are extra low-lint, extra absorbent, soft, and nonabrasive. They will not scratch delicate surfaces and clean without leaving any residue. Kimwipes come in a convenient pop-up box with a special anitstatic plastic lintguard in the slot to reduce airborne lint and keep contaminants out of the box. 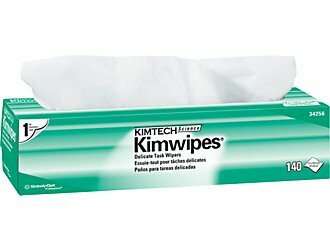 Kimwipes EX-L wipes are Single-Ply, extra low-lint, absorbent, soft, and nonabrasive. They are packaged in two sizes, small and large. Small size measures 4½" x 8½" and are packed 280 wipes per box. A case contains 60 boxes. Large size measures 15" x 17" and are packed 140 wipes per box. A case contains 15 boxes.